In June of 2017, Sprocket Mural Works contacted me and asked me to be a part of an upcoming mural project in York. It was a mural pop-up festival that would take place over the 4th of July weekend. The invited me to be one of the mural artists and my only two parameters were 1. 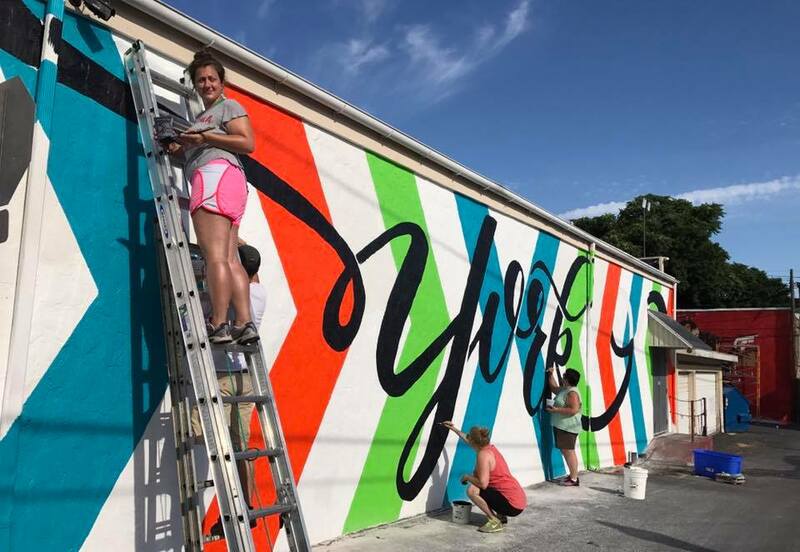 The mural had to say "York" and 2. it had to be in my hand lettering. I was honored to be asked! I accepted the gig with much excitement and from there I did a few different sketches to scale of the 12 ft x 41ft wall. After a few rounds of sketches and minor tweaks, it was settled what I would be painting. To top it all off, it had to be completed over the long 4th of July holiday. Every time I pass by the mural it is a fun reminder of that hot, sticky weekend and I still feel honored to have been asked to have a lasting piece in the city of York. If you are looking to visit this mural it is in the parking lot of Collusion Tapworks on the corner of E. King St. and Howard St in downtown York, PA.
Special thanks to Royal Square District and Sprocket Mural Works for having me be a part of the project. Rachael Scott and Gregory Timmons for helping me finish on time Monday morning and to my parents Bill and Patti Foster, without them, I would be lost, no where near the person I am today and still out there painting that enormous wall.